Pink Lemon Twist: Man Socks - Finished! 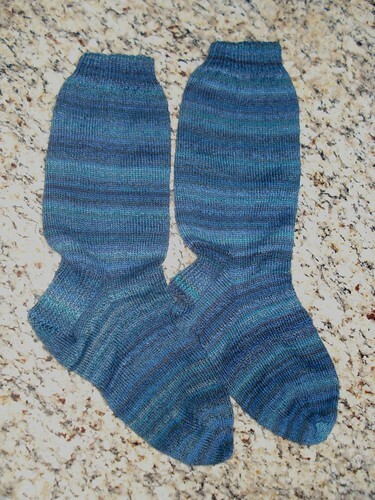 I finished up Mickael's socks Saturday morning! Now he's ready for our next ice storm. (Hopefully not until next January.) This is just a plain vanilla, stockinette sock. Nothing fancy or difficult, just a nice, basic, classic Man Sock. I used Trekking XXL in colorway 71 and I did use part of the second ball of yarn. (I've found that I need to plan on about 150 grams of sock yarn for Mickael socks, so I always get a little extra.) 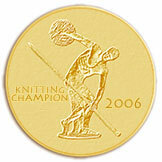 I knit these on US 0's (2.0 mm) at 9 stitches to the inch. I'll be sockless for another 24 hours until I can start my March Knit Something of the Month Club project, which is socks for me. I also may or may not have ordered some more sock yarn in Manly colors to make Mickael some more socks, since I realized that this pair of socks that I just finished is only the third pair of socks I've made him (and he has worn one pair to work - solid, dark gray with a rib pattern), so he should get more socks. When you consider that I've been knitting for 13 years, 3 pairs of socks isn't a very good pace.